and forest owners continues to climb, with only words not action to stem the tide. Everybody is talking about the fiscal cliff ahead. But what nobody is paying any attention to is the age cliff facing our private landowners. When the U.S. Department of Agriculture mails out 2012 Census of Agriculture survey forms to farmers across the country this December to update its 2007 Census, one key set of questions will focus on age. If the 2012 returns match the established trend, the average age of landowners will have continued to climb despite efforts at USDA, Farm Bureau, and elsewhere to make agriculture more competitive with other career choices. The demographics of our landowners are startling. We need to do more than just talk about it. 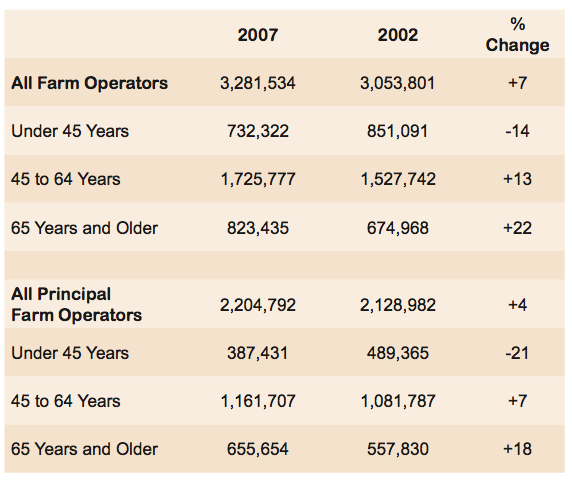 This USDA chart below tells the story, showing that for the 2002-2007 period, farm operator numbers were up 22% for those 65 and older while the count for operators under 45 dropped 14%. The age divide is even more dramatic in the case of America’s 10.4 million private family forest owners. 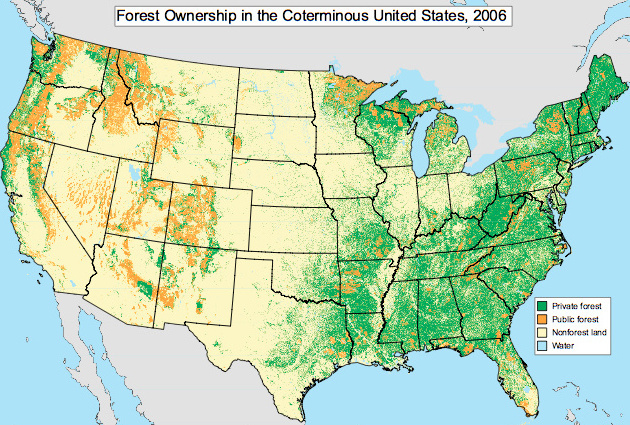 USDA’s 2006 survey found 229,000 forest owners under 35 years old versus 1,477,000 age 75 or older. While USDA’s farmer survey showed 5.4 times as many elderly as young farmers, the ratio is 6.4 in the case of forest owners even though the forest survey included owners up to 35 years old in the younger group rather than the age 25 cutoff used for the farm survey. With the 2012 Ag Census expected to show farmers’ average age over 58, the Forest Service’s Brett Butler estimates that the average age of foresters has climbed to 63 this year, up from 60 in 2004. The high percentage of private forest land likely to be sold within five years contrasts with the low percentage of owners making use of federal conservation programs and management plans designed to help these owners maintain their land as working forests. Clearly, current programs to deliver actionable information to landowners aren’t working. So it is surprising that in 2009, USDA abruptly cancelled the 2008 cooperative agreement signed with my nonprofit Resources First Foundation (RFF) to continue our highly successful Private Landowner Network (PLN) information service. 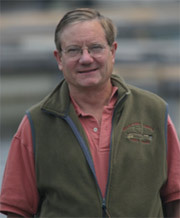 This unique free service provides comprehensive information unavailable anywhere else, connecting the nation’s 13 million landowners with the the full range of land and resource management tools they need to “keep working lands working.” In contrast to the tangled web of USDA sites, with their complexity increased by security concerns, the PLN sites are designed for maximum user-friendliness. Fortunately, with generous support from the philanthropic community, RFF and PLN continue to host our portfolio of web sites which empower landowners to improve their profitability and conservation stewardship simultaneously. With these sites on track to boost our four-million-plus page views for 2011 to over five million for 2012, the demand for this information is proven. Given this hefty demand, USDA’s Natural Resources Conservation Service (NRCS) should be doing everything possible to strengthen NRCS ties with RFF and PLN rather than allow our past agreement to be discarded simply because it was put in place by the previous administration. Canceling USDA’s information delivery contract with RFF is even more surprising because Sec. Vilsack clearly saw the age cliff ahead. But USDA has no programs to address this issue directly and instead has gone backwards in serving its aging demographics constituency. Nice words Mr. Secretary. But why not help our current aging farm population with intergenerational transfer and estate planning? That step would have an immediate impact on keeping the next generations engaged in agriculture rather than being forced to choose other careers. These issues have been clearly identified for two decades. With the world population growing from 9 to 11 billion, it is critical that we keep our existing agricultural land base as working farmland so that the U.S. can continue to feed the rest of the world. So the problem isn’t new. The solution isn’t easy. But there’s no avoiding the fact that much more needs to be done to “keep working lands working.” It’s all very nice to have Sec. Vilsack and others express the right sentiments. But what’s needed now isn’t more wordy promises. What we need is boots-on-the-ground action to keep our forests, farms and ranches as profitable, sustainable, entrepreneurial businesses – action that’s made possible by the rich array of one-stop-shopping information provided by the RFF and PLN web sites which together constitute the world’s most comprehensive and up-to-date conservation resource.